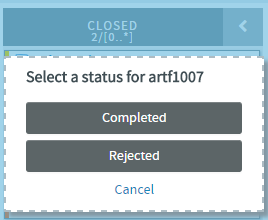 '3' is the total number of artifacts in the 'In Progress' status within the selected planning folder. Important: These values and constraint validation are planning folder specific and not team specific. For example, in the above scenario, the total number of artifacts is the overall count of artifacts which are in the 'In Progress' status within the selected planning folder and not within the selected team. Each artifact card displays its points (story points) or estimated effort if these fields are enabled in your tracker settings. If both are enabled, only the estimated effort is displayed hovering the mouse on which the artifact's points is displayed. Similarly, if all the effort fields (estimated, remaining and actuals) are enabled, you can view them by hovering the mouse on the estimated effort. Cards have a color-coded bar to visually identify the priority. In addition, the open and closed cards' background is color-coded to uniquely identify the status. A parent artifact card displays the count of its child artifacts (Show/Hide child artifacts button). Click this button to view or hide the child artifacts. If there are more than 5 child artifacts, when you expand the parent artifact, you will see pagination arrows ('Previous'/Next') at the bottom of the parent artifact card. If the tracker types of both the parent and child artifacts have been mapped with the kanban statuses, the child artifacts appear within their parent artifact card and also as an individual card. In the above scenario, Epic (parent artifact) and Story (child artifact) trackers have been mapped to the kanban status 'In Progress'. Story 'artf1014' is the child artifact of the epic 'artf1002'. So you will see 'artf1014' within the parent artifact card as well as outside of it as an individual artifact card. When a child artifact is closed, a 'Closed' tag appears next to the child artifact ID within the parent artifact card. You cannot move an artifact card to a status that is not mapped to that particular tracker type. For example, a 'Ready for QA' kanban status may not have been mapped to any of the epic tracker statuses. So when you attempt to move an epic to that status, you will get an Invalid status configuration error. You can move a parent artifact to the 'Closed' status only if all its child artifacts are closed. However, a child artifact is independent of its parent with regard to the status change, that is, when you move a parent artifact from one status to another, the status of the child may still remain unchanged. For example, an epic may have many stories, the status of some may change from 'Not Started' to 'In Progress' whereas some may not. So when the status of an epic as one single unit may change, it need not apply to all of its child artifacts. Click the required icon: Create Artifact or Create Child Artifact. 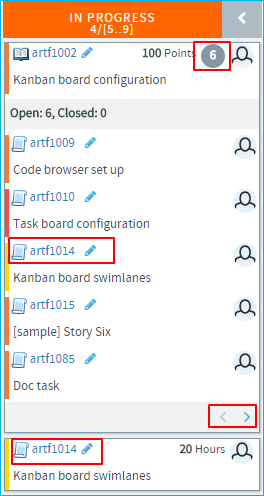 The Show/Hide toggle icon appears only on configured kanban boards. Your selection is saved for the subsequent sessions as well. Note: The positioning of cards is retained when you switch between the list and board views (planning, task and kanban). For related information on ranking artifacts in the list view, see Reorder the contents of a planning folder.